The Glasgow Mathematical Journal publishes high quality original research papers in pure and applied mathematics. An international journal, its policy is to feature a wide variety of research areas, which in recent issues have included noncommutative algebra and representation theory, geometric group theory, functional analysis, operator algebras, differential equations, algebraic geometry, differential geometry, mathematical physics, number theory, algebraic and geometric topology, and the application of such methods in applied mathematics. 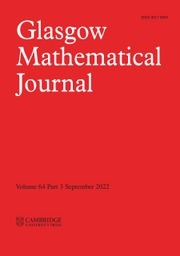 The journal is owned by the Glasgow Mathematical Journal Trust, which is a registered charity; all surplus income is used to support mathematics and the mathematical community. HOW SMALL CAN POLYNOMIALS BE IN AN INTERVAL OF GIVEN LENGTH?